I had seen this in a magazine about 6 weeks ago and automatically wanted it. I couldn't find it in store anywhere, only online at Adore Beauty. I don't know about you, but I HATE ordering 1 thing online. If you aren't spending much I find it frustrating to then have to spend $10+ on shipping. So I waited until it FINALLY arrived in Priceline 4 weeks later. For the last 2 weeks I've been trying this out and I LOVE it. It was worth the wait. The bottle reminds me of Kerastase "Elixir Ultime." Now I'm not sure if I got a dummy bottle, but when I "pump" out the oil it seems to go in every direction :( So it's a bit messy. But that just might be my bottle. The oil is fantastic. I use it more as a treatment oil rather than a styling oil. I put it on my hair 30 minutes before washing to help protect it. And I love using it in overnight to nourish and repair my hair while I sleep. It has a herby, earthy smell that won't appeal to everyone but I don't mind it. It contains argan oil, sweet almond oil and brazil nut, so you know it's moisturising and nourishing on your hair. Because it's powerful you only need 1-2 pumps. If you add too much, like any oil, it will make your hair lank and gross. So it will last you a long time. 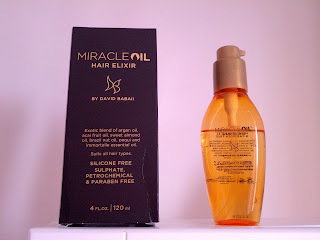 The oil will not only condition your hair, it's also great for coloured hair, reducing frizz and protecting from heat. Because it doesn't contain silicones, you won't have product build up. It also doesn't contain sulphates, parabens and petrochemicals. I love that all of David's products don't test on animals. He also donates 10% of the profits to WildAid to help endangered animals. So not only can you look amazing like Kate Hudson, Sarah Jessica Parker and Angelina Jolie (who he styles), you can do it ethically and give back to nature. Are you a fan of David Babaii? Do you get hair envy when you see Kate Hudson too (I do!! Such AMAZING hair? Try his Bohemian Beach Spray! It smells incredible. Check out his website for some great videos. You can check them out here. I love seeing a pro in action! It's the closest to a professional hair styling lesson I'll ever get! I'm still using the Davroe argan oil but its become a staple for me so I'll have to invest once it runs out! Ooh I'm currently using Organix Hydrating Macadamia Oil as treatment and just ordered my first Kerastase product the other day, waiting for it to arrive. I wonder if it would be a bit overkill to buy this right now as well.. but I will definitely keep a look out for it!! I haven't heard of it before so thanks for introducing this! I'm currently loving my Babyliss Argan Oil...I've been using it for a few months and just bought a new bottle.